International Maritime Satire Week Warning: The following is a piece of fiction intended to elicit insight through the use of satire and written by those who do not make a living being funny – so it’s not serious and very well might not be funny – but apparently producer Todd Stanley thought so (see comments below). SILVER SPRING, MD—Following a loss in ratings to NBC’s Stars Earn Stripes, the Discovery Channel has decided to change the setting of its award-winning reality fishing show Deadliest Catch to the South China Sea. Sources indicate that Discovery intended to cancel the series until Deadliest Catch producer Thom Beers presented the idea of moving the setting to either the Strait of Hormuz or the South China Sea. With the annual ratings boost from Shark Week a year away, Discovery elected to keep the show and film the next season in the hotly contested Southeast Asian waters. Beers explained that the region’s depleted fishing stocks will actually enhance the show’s intensity because it raises the stakes for the competing fishing vessels. “These guys will be fighting each other for every single fish—literally,” said Beers said with a grin. The crews of Deadliest Catch will face many exciting new challenges in the 9th Season. Discovery announced that they are also moving Sons of Guns to Iraq and American Loggers to the forests in Colombia. Production on Season 9 starts in October and will premiere on the Discovery Channel in early April. Previous PostPutin Announces New, Innovative Naval Policy: Build Massive NavyNext PostIranian Navy Plans to Alleviate Burden of Global Maritime Responsibilities from U.S. The statement by the Japanese MFA Deputy Press Secretary was priceless. Hi, I’m from Australia and i love the deadliest catch and there are many other Aussies that do too. Todd, I hope this is a joke. Just not sure if it would fly, but I’m not a producer, so what would I know. It says its satire, but is it or is it a market study? That’s pretty awesome that you and Thom are partners. You’re loaded T! Hi. I am a avid fan of deadliest catch. Do you think this is true about change of location? The show was great, I think the loss in ratings was the passing of Phil Harris, his sons still kept the show alive, and Sig and the rest. AMEN TO THAT, I STILL MISS, MR ONE LINER , & HIS SONS ,JOSH & JAKE, ARE TRUELY A CHIP OFF THE OLD BLOCK, AS I WAS VERY LUCKY, TO HAVE MET THEM, AT THE 2 BIT SALOON, IN AUGUST,26,2010. I ALSO MET SOME MORE OF THE GUYS OF THE SHOW WHILE I WAS THERE, I WAS VERY HAPPY, TO HAVE MET THEM . I ALWAYS PRAY TO GOD THAT, THEY ALL COME BACK HOME, TO ALL THERE, FAMILY & FRIENDS, SAFE & SOUND. MAY GOD BLESS THEM ALL !!!! & ALSO , STUFF THERE TANKS. !!!! IU am pretty sure crab boats are unarmed so they would have to be outfitted with some self defense capability. I love this show!!! Can’t wait for season 9 !! I hope jake and josh come back on their boat Cornelius Marie!! when is the new season starting? I have been a faithful follower of these men and their boats. It would be a shame if we lose or change any of this show. PLEASE WE LOVE ALL THE GUYS !!!!!!!!! Todd, you’re a sick pup and I like that! Could you imagine PHIL’s reaction if theis really WAS true? Whooooeee! 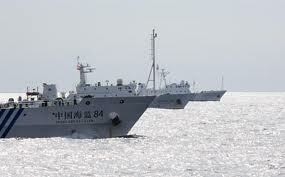 S. China seas…really? It seems unAmerican to me. The show was our guys in our waters struggling to survive. Time Bandit and Northwestern – my favs. Not sure if I’ll watch…but I do love the action! Been a huge fan for years, will surely miss the format if it changes. Love the usual crewes. Loved Phil Harris. Pretty funny stuff! I’m glad to see Todd get more responsibility with the show. Season 9 will start in April, just like every year. Should be an interesting time. Let’s see Keith explode over Asian people screwing up his fishing. Love the show, I will certainly be tuning in for this season. Not so sure about the new setting but hey, you never know till you watch and see!!!!! If for some reason its a bust, I’ll continue to watch 1-8 all over again, even if I already know every “catch” by heart. I hope they stay on American grounds but wherever they will be, I will be watching faithfully as always. God bless all the crews and can’t wait til the first episode!!! Deadliest Catch rules even though everyone misses Capt Phil. Lots of love and stay safe! Are they not going to be crab fishing anymore?i still love the show and the guys. miss captain phil though. Did the people who wrote this ever watch the show? Apparently they weren’t aware that, despite the title of the show, it’s about crabbing not fishing. That would be pretty “interesting” to see those American crab boats and crews attempting to catch fish. Oh wait, it’s satire, so such details don’t matter. Oh yeah! Time Bandit has no problem protecting their crew! Jonathan has a pretty quick shot!! I truly wish Josh Harris would step up and take his fathers legacy by the horns and run the Cornelia Marie.He has what his father has/had carisma. he can do it.long time crew member Freddy needs to come back to the boat as well. Josh has got this. This has always been my favorite show. I have the utmost respect for all the guys out there risking their lives for us to enjoy the crab they catch!!!! Can’t wait for the next season and many more to come!!! I am also rooting for Josh and the Cornelia. 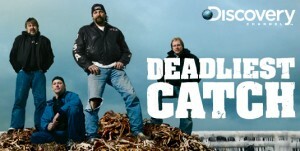 I am soooo excited for the new season of Deadliest Catch to start!!! This is guna be another nail biter season! Love all the brave crews especially the Time Bandit and Northwestern! May God bless them all with a safe trip and full pods!!! I am not happy with the change of location I think it lose viewers I watch it because they catch crabs heanch the name deadlist catch. People, read how that starts. First of all, it tells you it is a joke. Second, it is not just called crabbing, but crab fishing. So, yes, they are fishing. Some people don’t realize that when you go out for crab, you are still fishing! My husband and I love the show and miss Josh and Jake. I can’t imagine that Discovery was thinking of cancelling Deadliest Catch,what are they thinking.I started watching this show when buddies of mine told me about it half way through season 1 and have watched them all up to date and I love them guys and the show.Discovery,no Deadliest Catch no me watching your channel anymore.I don’t care where they go as long as I get to watch them catch crab and you can’t keep going into American waters,next thing the grounds will all be cleaned up,you have to move around for the other little ones to grow to the required size.Yes crab fishing is fishing du! By moving around to different waters is testy that’s why it’s Deadliest and to beat them waves.Hope the Cornelia Marie comes back and my favorite boats are Time Bandit,Northwestern,Sherbrooke,I like what and how Jr. Campbell fishes after last season he knows what the hell he’s doing and how to get his quota up high for a young guy,way to go Jr. Keith you gotta cool down before you pop your lid. I’m a huge fan of this show and can’t wait til it starts in April,times a tickin’.